The Buenos Aires Ezeiza International Airport is Argentina's main gateway, serving almost nine million passengers annually. This is actually around 85 percent of the country's total air traffic, which clearly indicates the scale of operations. It is also a major gateway to South America in general, with flights coming in from Europe, North America and Australia. The airport is a hub for LAN Argentina and Aerolineas Argentinas, the main local carriers, and received its first overseas flight from London in 1946. There are three terminals today - the International Terminal A, the Aerolineas Argentinas Terminal B and the National Terminal C. Facilities are good and include a variety of restaurants and shops. Some of the major airlines flying to the Buenos Aires Ezeiza International Airport include British Airways (from London), Air France (from Paris), KLM (from Amsterdam), Alitalia (from Rome) and American Airlines (from New York). Officially named the Ministro Pistarini International Airport, the site is located within the Ezeiza district, about 35 km / 21 miles to the south-west of Buenos Aires. Despite this distance, it is conveniently close to the General Ricchieri Expressway, making getting into the city from the airport straightforward. The General Ricchieri Expressway runs north-east and past the airport, towards the centre / south of Buenos Aires. Those with a rental car will find that the city is simple to reach from the airport, with trip times of about 40 minutes. If necessary, you can head directly to the southerly beach resorts without having to drive through Buenos Aires. Worth noting, driving is on the right in Argentina. Book your Buenos Aires Car Rental here. It is sensible to avoid taking the bus, which can prove slow and confusing if you don't know Buenos Aires. Bus number 8 is cheap and runs from Terminal B, but it takes up to two hours to reach the Plaza de Mayo. 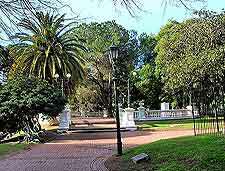 It also serves Rivadavia Avenue and Hipolito Yrigoyen. Transferring by coach is a better, faster option - the Manuel Tienda León service leaves every 30 minutes. Prepaid Remis taxis are the easiest option for getting to the city from the Buenos Aires Ezeiza International Airport. You pay at one of the booths outside Arrivals and wait your turn. By taxi, the trip into the city centre will take in the region of 30 to 40 minutes. Visitors can also hail taxis nearby, which are generally cheaper, although not as reliable.